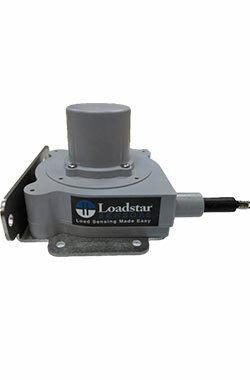 Loadstar Sensors offers three types of displacement sensors based on three different technologies: One is based on a linear potentiometer, one based on a rotary potentiometer and one based on a digital linear encoder technology. These serve applications with varying ranges and varying accuracy and cost point requirements. 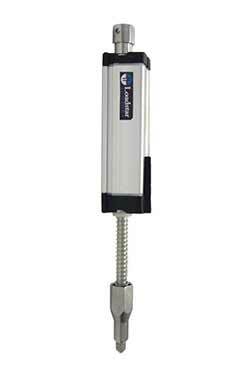 LVDTs are linear potentiometers which change resistance when a plunger's position is changed with respect two a fixed surface. When a voltage is supplied to the LVDT (say a 5 V DC input voltage), the output varies between 0 to 5 V DC from zero full scale displacements. These sensors are good for short distances of about 0 to 50 mm displacments (about two inches) and offer about +/- 1% accuracy of the full scale range. String Potentiometers are rotary potentiometers which change resistance when a rotor's position is changed with respect two a fixed point. When a voltage is supplied to the String Pot (say a 5 V DC input voltage), the output varies between 0 to 5 V DC from zero full scale displacements. These sensors are good for longer distances of as much as 80 inches! 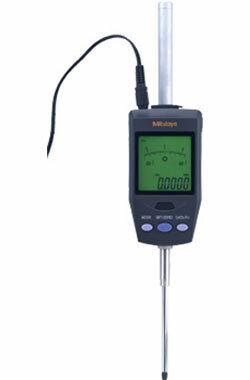 They offer accuracies of about +/- 1% accuracy of the full scale range. We offer string pots with USB output or string pots with wireless output depending on your application needs. When you need very high resolutions and accuracies over small displacements (under two inches), then these digital encoders are the best choice for your application. 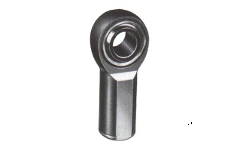 These sensors are available in 12 mm and 24 mm ranges and offers accuracies of as much as +/- 0.0015 mm over that range. They are available only in USB output configuration.